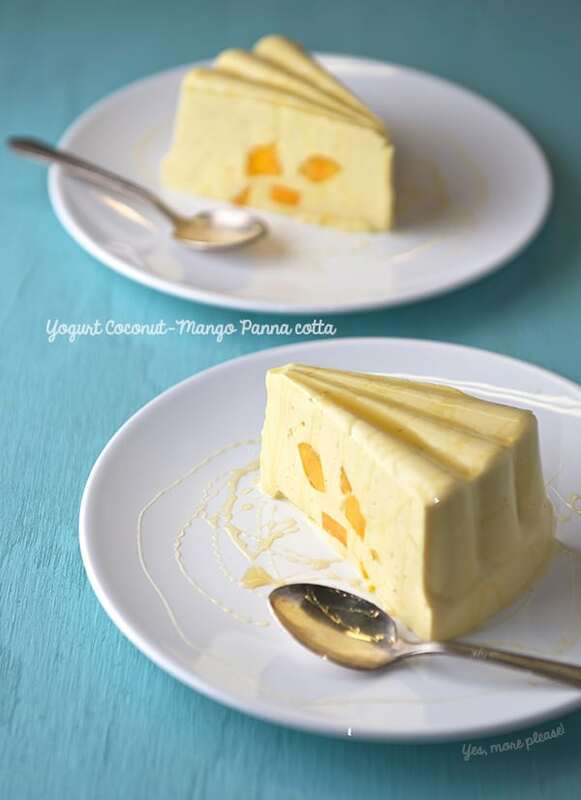 Yogurt Coconut-Mango Panna Cotta ~ Yes, more please! 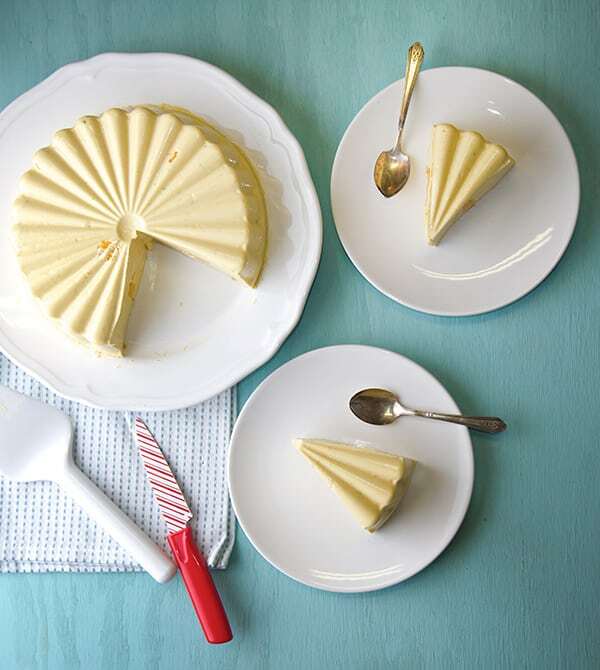 This dessert is just perfect if you want to incorporate delicious fresh fruit with a creamy luscious texture. The yogurt mixture includes a bit of gelatin without getting the kitschy translucent rainbow colors molded dessert from the 50’s. Instead, you get a custard-like creamy consistency that is delicately sweet and tastes mainly of …fruit! This recipe is also a cinch to prepare if you are pressed for time and you have a small party or family dinner, make it the night before in less than 30 minutes, refrigerate and next day is ready to serve. 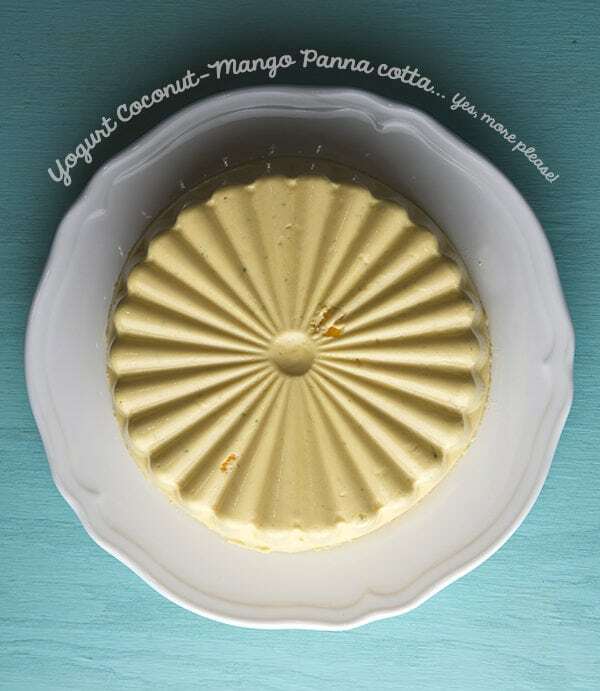 This Pana Cotta will be ready in approx 3 hours if kept in a good chill area in the fridge. Find an interesting mold (mine came from Goodwill, next to the sad wicker baskets from Thanksgivings past) a little whimsical shape it’s always appealing to the eye. Toppings like honey or Agave nectar let you control the sweet sugary qualities so you can tune it to your tastes. In season soft fruit of any kind will be great substitutions like berries, stone fruit, like peaches and nectarines. Other good tropical options like pineapple will be fantastic. Makes a 10″x 3″ round mold holds 6 liquid cups. Serves 6 or 2 tropical creatures. *7 grams envelopes about 1/4 ounce. If using loose gelatine, one envelope equals 2-1/2 teaspoons. 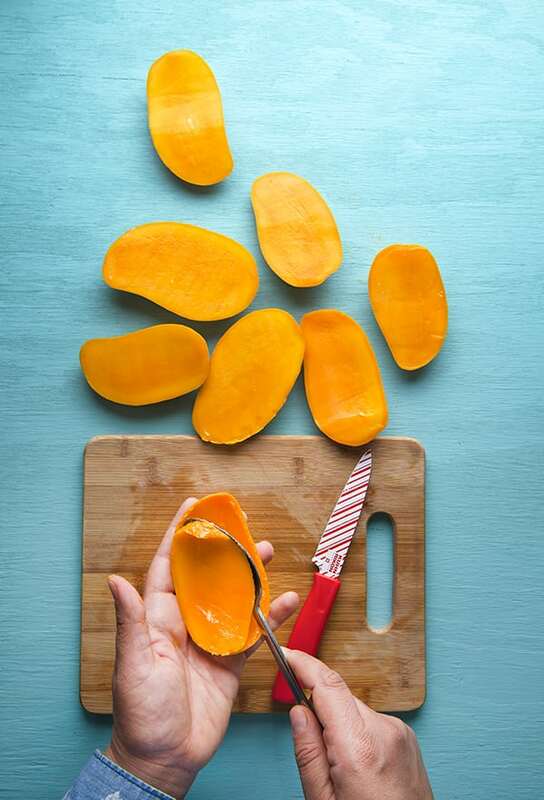 *When choosing your mangos, remember the more orange the skins are, the sweeter the mango. 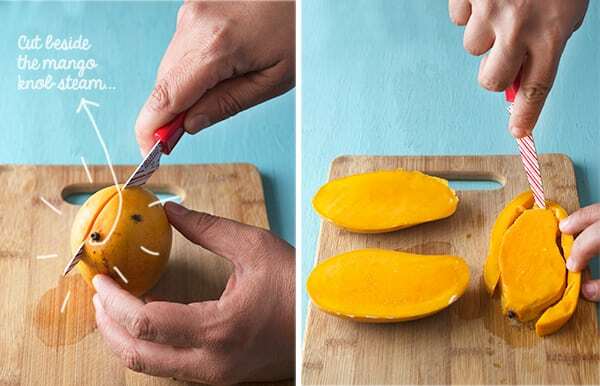 Look for the mangos with slightly wrinkly skins, those are usually perfectly ripe and sweet. Before starting the recipe, taste your fruit to check the level of sweetness, if the fruit is too sweet you might need less agave nectar, if the fruit is not too sweet you might need to add a little more sweetness. 1. 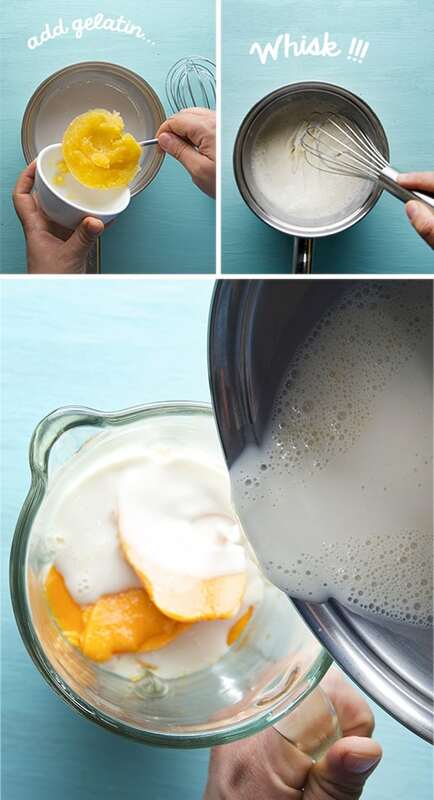 In a small bowl place orange juice, and evenly sprinkle the gelatin powder to hydrate. Let stand for 5-10 minutes until blooms. 4. Add hydrated gelatin into the warm coconut milk, whisk until it has completely dissolved. 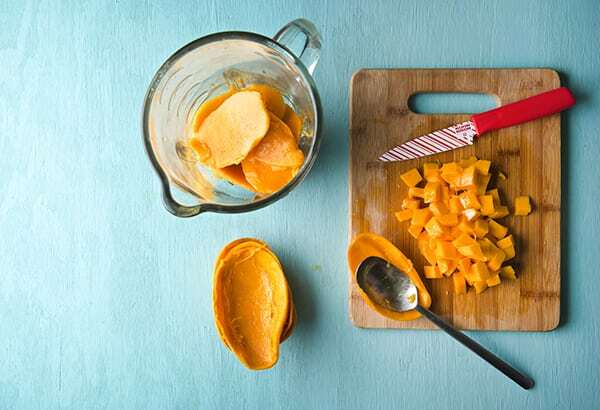 Add this mixture into a blender along with the mango puree and blend until smooth. 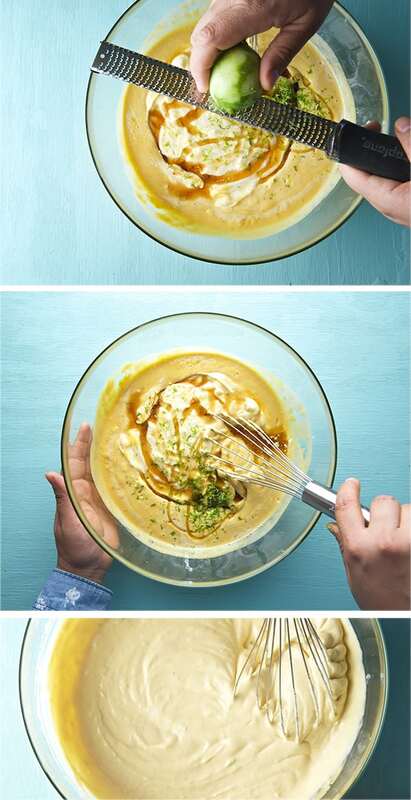 5.In a large bowl place the yogurt, the mango blender mixture, raw agave and lemon zest, and whisk until smooth. Taste for sweetness, and adjust if necessary. 6. Lightly oil your mold with a neutral-tasting oil. I used a few drops of grape seed oil. 7. 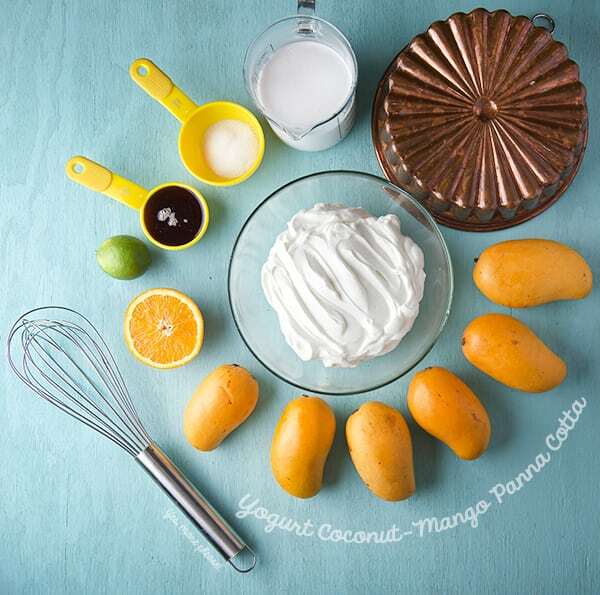 Pour the yogurt mango mixture into the mold and sprinkle the diced mango. 8. Cover the mold with plastic wrap, refrigerate for at least 3 hours or until feels firm to the touch. 9. Carefully run a thin sharp knife around the edge between the Panna cotta and mold. Place it horizontally and carefully rotate the pan, this will create an air bubble and it will be very easy to unmold. Place a plate and do the flip ah-roo. of honey for texture and flavor, Honestly it tastes great as it is with out any garnishes.